In April I traveled with members of the BGSU SPJ student chapter to the Regional Conference in Dayton. At the conference Glenn Hartong of the Cincinnati Enquirer shared with us some of the mobile tools and techniques being used by Gannett reporters. The Enquirer recently equipped all of its reporters with iPhone 5s and now encourages them to shoot and edit video from the field as well as report live when it's appropriate. Below is a summary of some of the ideas that Glenn shared. If you're thinking of using an iPhone, iPad, iPod or some other mobile device for backpack journalism, then several of these suggestions should help get you started. Step 1. Write a few graphs about the story as it breaks. Step 2. Use Instagram, Facebook, Twitter and/or other social media to tell your audience about the event. Step 3. Do quick edits on the video and upload the video and the story to the newsroom to be posted on the website. Step 4. Go back to the newsroom for finer editing for future multimedia packages and/or deeper content. When you're in the field, you'll also want to think about what types of connectivity are available to you before you go. If you're using an iPod and you don't have a wireless connection, then you might consider purchasing a 4GHotspot that will allow you to access the web over a 4G network. There are several mobile hotspot options. This video will familiarize you with how it works and what you'll need to purchase. In addition, if you're going to be reporting from a place where 3G is your only connectivity option, then shooting lots of high resolution video can take a great deal of time to transfer across the web. In this case it's best to remember the old rule- 'audiences will tolerate poor video, but they won't listen to bad audio.' As a result, your first goal should be to make sure that you have captured some good quality sound. That's not to say that good video doesn't matter. If you find yourself in a situation where you have great connectivity, and you can upload high quality HD video quickly to the newsroom, then you should definitely do so. Otherwise, if connectivity is limited, you might consider rendering out a lower resolution video (e.g. 320×240 px) that can be uploaded quickly. You can always replace the video with a higher quality one once you get back to the newsroom. 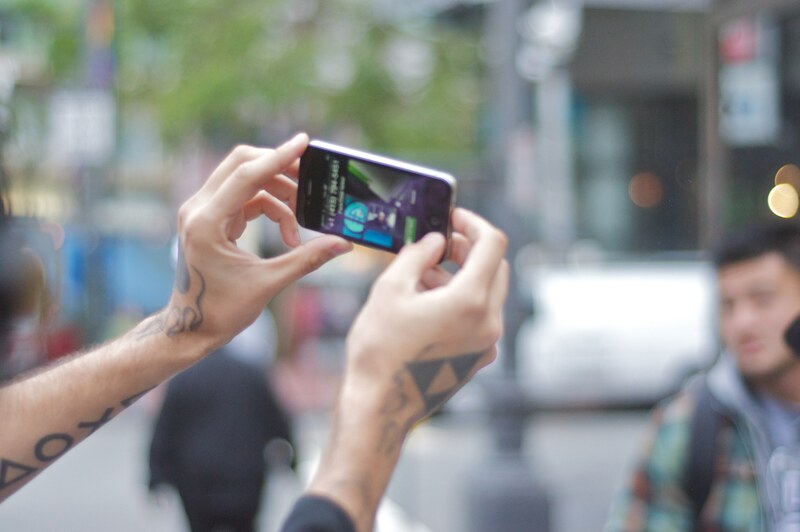 It's important to remember that the iPhone 5 shoots video in native 1080p resolution. Depending on your connectivity and the length of footage you may want to use a few apps to "downgrade" your video content to a lower resolution. FiLMiC Pro is a useful app that gives you lots of control over your video. Among its many features, you can adjust the resolution, include GPS tagging, and frame rate. If you plan on doing some editing, then another useful app that is pretty user-friendly is iMovie. While editing video in the field on either an iPhone or iPad is going to give you less control than what you might have with more sophisticated software packages like Final Cut, using these apps will help you get the news out quickly when time is limited. are two other handy tools for mobile reporting. 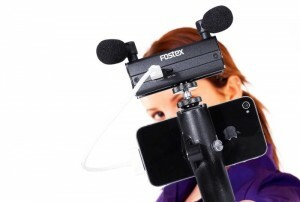 The Fostex connects directly to your iPhone and uses a monopod-like grip for easy shooting. Two microphones can be adjusted so that they point in both the direction of the reporter and the interviewee for better sound capture. And if you're interested in connecting to an external mic, B&H Photo has put together a nice package complete with lav mics that connect to the Fostex line inputs. If your iPhone is going to be your only option for shooting, you might also want to consider an Olloclip. The Olloclip essentially works as a lens system for your iPhone, allowing you to do a bit more with creative photographic techniques such as fish-eye photography, macro and wide-angle shooting. You may find yourself in a situation where shooting live is critical. Several apps are available for such occasions. Qik.com and Livestream have partnered together to offer options to stream events live. In addition, Ustream is another app that allows you to stream live from their site, once you've set up a Ustream account. Not every story is going to need video. Let's face it, some stories just aren't big enough or exciting enough. So when you plan your stories, you should consider whether the video you're about to shoot is worth the time. Online videos serve two purposes. First, as a reporter, you should be shooting video that tells a meaningful story. Video coverage is going to add depth and interest to your story. Furthermore, the content you shoot should complement the story that you've written for web rather than merely repeat it. Video, however, also has a practical function for a news organization. Advertisers interested in posting banner and video ads on a news website are interested in knowing the number of people that visit a website and the amount of time they spend on it. By using video on your site, you provide additional incentives for audiences to stay longer, and your video may be another space used for advertising revenue. All of this suggests that video on any news site should not just fill a news hole, it should provide additional content that audiences would want to invest the time in watching. Remember that light and noise are important. That means that you're not likely to shoot video in dark and noisy places. If the story you are covering takes place on a busy street or in a dimly lit theater, you're likely not going to get footage that is worth shooting. Choose videos that have compelling characters. One way to tell whether you have a story worth shooting is to think about the people you're going to interview. No one wants to listen to dull, boring people drone on and on about a topic, but if your subjects have interesting ideas or interesting personalities, then they might make a good choice for video content. Recently, Charles Ramsey made the news for his role in freeing three young women from a home in Cleveland. Within hours of this video, Ramsey's comments received millions of hits on YouTube. What makes this footage so compelling is Ramsey's personality and no-nonsense way of speaking. When you have subjects like this, then you might want to consider using video to capture some of that personality that isn't so readily captured with words. Sometimes we use video in news reporting because our audience likes to hear the information straight from the horses mouth. In other words, we might choose to shoot some video because our interviewees bring a certain authority to our story. For example, there are often times in reporting when the information is best heard by a public official. The words of officials and experts carry weight, and sometimes that can add to your content. You might for example, include a few seconds of a city councilman talking about a proposed city ordinance, or a police officer discussing the events that led up to an arrest. Sometimes video footage is worth shooting because a reporter can take an audience somewhere that they can't normally go. This might be the inside of a factory, a crime scene, or maybe the backstage of a concert. Whatever it might be, audiences appreciate it when the reporter takes the time to share the adventure with them. The mobile phone is like the Swiss Army knife of reporting. Its portability, its ease in networking with audiences, and its ability to record photos, audio and video all make it a must-have tool for any backpack journalists. While it is true that the basic principles of good storytelling haven't changed, learning to use the new tools that are at your disposal can enhance your stories and make the online news experience more meaningful for your audiences.